Are you familiar with the U.S. Council on Women and Girls? If you are a woman, where do you stand when it comes to the concept of “equal pay for equal work,” and where do you think that concept should be applied? For example, do you think the equal pay for equal work concept should be applied to women and men who are earning their livings playing professional sports? If so, there is at least one modern professional sportsman who disagrees with you. Does Simon’s opinion surprise you? Should there be a different standard applied when it comes to equal pay when the work occurs on a tennis court or on a NASCAR track (I’d bet that Danica doesn’t think so)? Both Simon’s statements last June and the fact that the U.S. Council on Women and Girls was created by an Executive Order as recently as 2009 make me question how far women have progressed in our society at large. 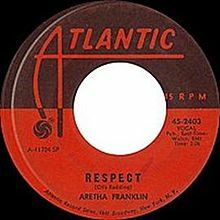 Aretha first sang about women’s desire for “Respect” in 1967, but I think that her woman cry for gender equality, without a doubt, still applies. « Which Gal Would You Walk a Mile For? The great thing about Society facing reality and attempting change is how it gives people permission to question the status quo; disallows secrecy and behind the scenes behavior and – as per the suffragettes – liberates us all. Thank you for your lovely comment on teamgloria. Feels so good to be Here. And in a way, starting again.